If you're looking for a UK based professional entertainer who travels the world mesmerizing and amazing audiences, Simon is the one for you! 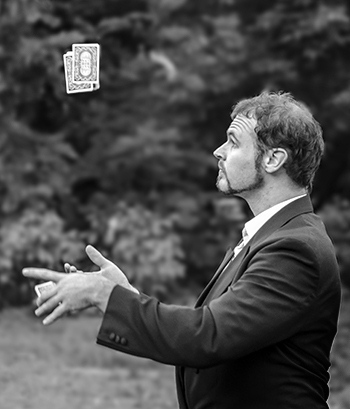 Much more than magic and juggling, Simon's entertaining skills will leave the audience wanting more! Simon combines multiple skills - a licensed bar manager, he entertains as he pours drinks. Add a spot of juggling and you'll guarantee an excellent and entertaining evening for all of your guests. Combining those skills has enhanced his reputation for stylish flair bar-tending with some impressive bar magic added for good measure. A trained circus performer, Simon is also an accomplished magician . . . guaranteeing a memorable and rewarding evening's entertainment for corporate functions, private parties... any audience which needs a world-class entertainer. How good is he? Well... Cirque du Soleil employed Simon as a walkabout magician (Auckland, NZ) and that's top shelf in anyone's language.